Memo. No.ESE01-12022/41/Prog. 11/21/2018, Dated: 21.06.2018. School Education Department - Extending General Holidays for two (2) more days i.e. from 22.06.2018 to 23.06.2018 to the schools of all managements due to heat waves prevailed in the State - Orders - Issued. 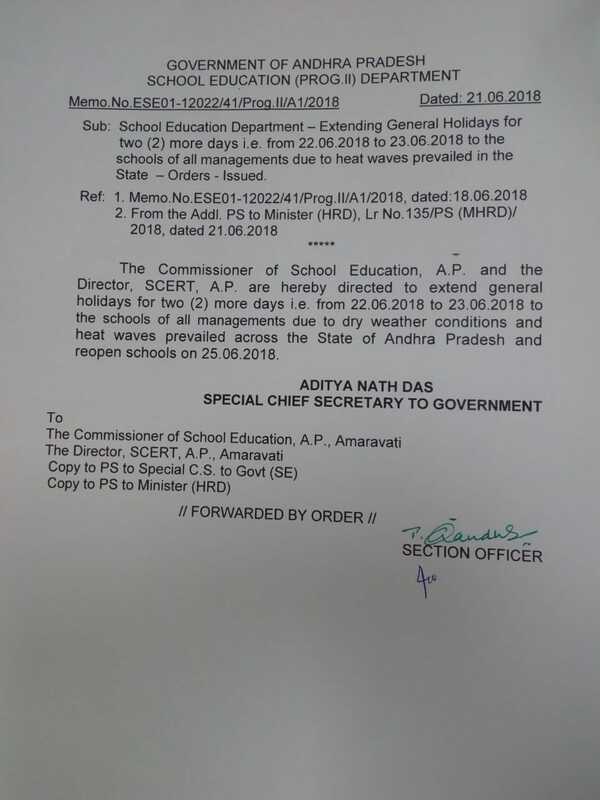 AP Govt.Memo ESE01 AP Schools will be closed due to heat waves from 19/6/18 to 24/6/18. All Schools closed due to heat waves from 19/6/18 to 24/6/18 AP Govt.Memo. The Commissioner of School Education, A.P. and the Director, SCERT, A.P. are hereby directed to declare general holidays for next (5) days i.e. from 19.06.2018 to 23.06.2018 for all Government, Zilla Parishad, Mandal Parishad, Model Schools, Aided Schools due to dry weather conditions and heat waves prevailed across the State of Andhra Pradesh and reopen schools on 25.06.2018. రాష్ట్రంలో ఎండలతీవ్రత దృష్ట్యా ప్రభుత్వం మరో రెండ్రోజులపాటు పాఠశాలలకు సెలవులు పొడిగించింది. Sub: School Education Department - Extending General Holidays for two (2) more days i.e. from 22.06.2018 to 23.06.2018 to the schools of all managements due to heat waves prevailed in the State - Orders - Issued. 2. From the Addl. PS to Minister (HRD), Lr No. 135/PS (MHRD) 2018, dated 21.06.2018. The Commissioner of School Education, A.P. and the Director, SCERT, A.P. are hereby directed to extend general holidays for two (2) more days i.e. from 22.06.2018 to 23.06.2018 to the schools of all managements due to dry weather conditions and heat waves prevailed across the State of Andhra Pradesh and reopen schools on 25.06.2018.